2016 finds the City of Southampton invaded again by wildlife! 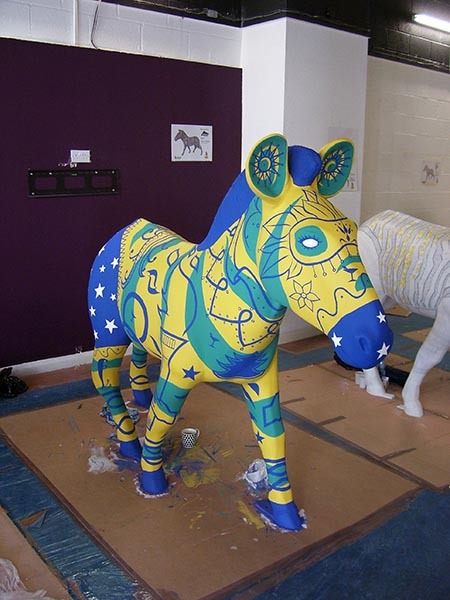 In 2012 it was Rhinos, or rather Rhino fibreglass statues painted by local artists and schools. This time around it it Zebras and again painted by local artists and schools, though this time the 'trail' which runs through the city is larger than before. It has been masterminded by Marwell Zoo, Hampshire as before. For the trail I created two designs before Christmas 2015, which were then submitted early in the new year to Marwell, who in turn presented them to possible sponsors. Both designs were accepted. 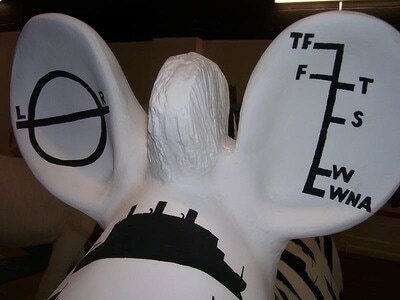 One design was accepted by 'Associated British Ports' who had sponsored my 2012 'Go Rhino' design. It is again a design that would appeal to their business involved in shipping, and features many ships of different designs as black silhouettes replacing the black distinctive strips as found on a typical Zebra, but retaining similar pattern/ proportions around the body. It was named 'Seafaring Zebra'. The design is basically B/W, done using emulsion paint. Hidden is the design are some very small zebra silhouettes, painted in blue, standing on the decks of some ships. The Rhino design from the previous campaign used silhouettes of the animal within the design so I carried this idea through for this design. The other design was something I had not planned on doing. Originally I submitted the single 'ABP' design for the 'trail' but received a general email a few days later, which asked everyone for some additional designs based on themes as presented on an accompanying list, one of those being a request for a Brazilian themed design. So I hurriedly put together a concept over the weekend and sent it of. I was then informed a few days later that this extra deign as well as the ABP design had both been approved. 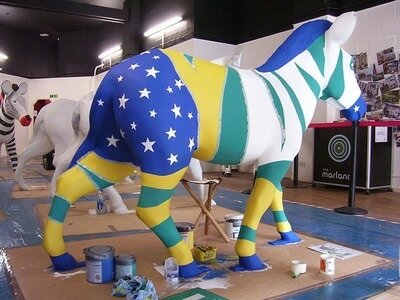 The sponsor of this design was a chain of Brazilian themed restaurants called 'Casa Brazil'. They like my concept very much which consisted of a design that used the colours of the Brazilian flag. I felt that this was a good starting point to a design as the well known colour combination shouts 'Brazil'! Again like previous designs I wanted to keep the design simple with solid shapes and a limited colour range, and no 'shading' whatsoever, as this creates so many complications. 2016 is the year of the Olympics in Rio, Brazil, so it was natural to build this theme in to the design. The Olympic rings are not allowed to be reproduced in any designs without permission, so I hinted at the event by showing a few rings and by the inclusion of the Olympic torch, both internationally recognised icons of the event. In addition the design consists of 'curves' and other decorative elements to hint at the carnival at Rio de Janeiro, including a face mask on the front of the Zebra. However the client did ask for some indication of their restaurant chain to be built in to the design, so some cocktail glasses and their logo, which looks like a part of the torch flame were incorporated. And as on previous designs some Zebra 'silhouettes' were hidden in the design. All of these elements were painted on by hand on top of a 'striped' zebra base, using masking tape to give a clean line between each colour segment. Work started during late February on the 'ABP' sculpture initially, with work on the 'Casa Brazil' (Rio) one a month later. Work was finished during late April on the pair. 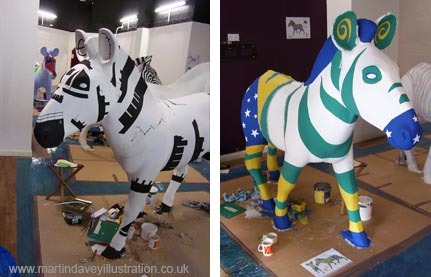 In addition a miniature of each Zebra design was created using a simplified version.The APB zebra was positioned on a recently landscaped area beside Platform Road, opposite Queens Park. Some of the large cruise ships can be seen docked here. The Casa Brazil Zebra was positioned very close to the ABP one. It is to be found within Queens Park, and very close to the actual Casa Brazil restaurant on Queen's Terrace. The trail runs from 16 July to 25 September 2016 in the city of Southampton, Hampshire.